From the time I was old enough to apprehend the events surrounding the passion of our Lord, I was captivated and would try to imagine what it would be like to be a face in the crowd as events unfolded. This has only intensified as I grew into adulthood. Songs like “Were you there?” or “I only want to say” from Jesus Christ, Superstar served to fuel these desires to have wanted to witness those events. But for all these flights of fancy, I learned a much more profitable way. Rather than letting our imaginations run free, chasing events and dramas of our own makings, we need not look further than Holy Scripture in order to catch a glimpse of Christ’s passion and propitiatory death. St. Matthew’s gospel narrative gives us a gripping account of that moment, as Jesus was about to become the Lamb of God who took away the sins of the world. In one such moment, we find our Lord and his eleven remaining disciples at the gates of an olive grove on the eve of the Passover. It had been a long day that was punctuated by the Seder meal, which was full of carbohydrates and wine. It was approaching midnight when the band arrived, minus one disciple who departed to deliver his master over to those who desired his death. 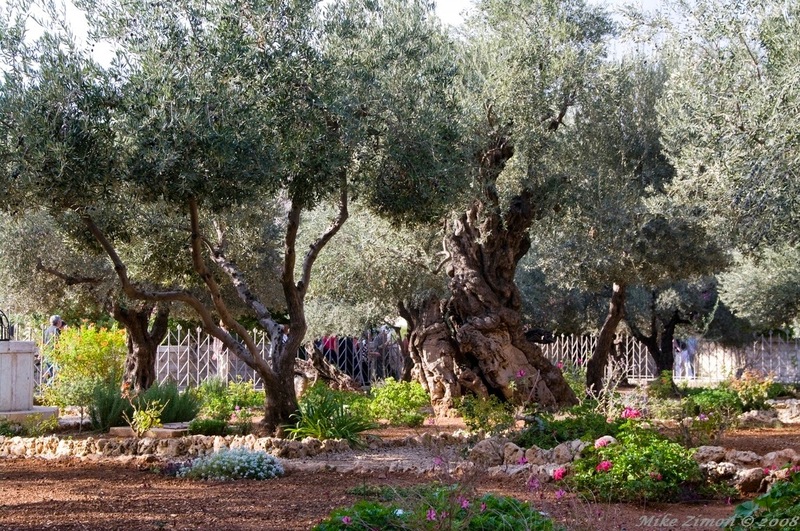 It was here that Christ instructed eight members of the band to wait, while he and three of his closest disciples walked deeper into the into the grove. With each step deeper into the olive grove, the gravity of what would soon transpire began to crush the sacred heart that bore no sin. Its fair to presume that in his omniscience, Jesus was very likely seeing the next sixteen hours of his life unfold. Scenes were unfolding; the cohort that was converging on their location, the bitter cynical kiss of the traitor, the lying testimonies of those who would come before the Sanhedrin, and the crowds calling for his crucifixion. These alone were terrible but the coming hours would hold an unimaginable terror for the Son of God. For all of eternity, Jesus knew the sweet communion of being one with the Father. Yet soon, in a moment that would seem an eternity in itself, that communion would be severed. It was in this dark moment that he commanded the three to wait and watch. These words are somewhat defanged in our contemporary language. Yet for Peter, John & James, these words had tremendous weight. The three were commanded to remain and wait. For most of us, the idea of waiting can bring unpleasant thoughts to mind. Here in Northern Virginia, waiting can almost seem like a curse. Daily, we wait in traffic. We wait in lines. We wait for the next available operator after pressing a number of the language of our choice. It’s our natural inclination to hate waiting. We acquired this early on when even as babies, we hated waiting as evidenced by our 120 decibel cries when the baby bottle was delayed. We’d muscle our way to the front of the line because we didn’t want to wait our turns. It’s made manifest in our day-to-day language in expressions like “I can’t wait”. The three disciples weren’t made of stained glass; they were men who shared the same weaknesses that seem to trip us up at any turn. Waiting didn’t come any easier to them. Nonetheless, Jesus commanded them to wait. He didn’t direct them to kill time while spoke with the Father. No, to wait in the garden was in a sense to abide with Christ in the grove on that night. They had heard this before when Christ exhorted them and others to abide in him, otherwise they would have no part with him or his Father’s coming kingdom. The night would soon become terrifying and there would be a strong temptation to scatter off into the darkness. In this command, they were exhorted to resist this temptation. The three were commanded to watch. This wasn’t a mindless or inattentive watching like one in the departure lounge, nor was it the casual watching of the world while sipping an iced Americano at Starbucks. This was active and attentive watching. It was in a real sense, watching as if one’s very life depended on it. The three were called to watch like a storm spotter on a day when conditions are ripe for tornadoes to spin into life. Tonight, Peter and the sons of Zebedee were called to watch their Lord, watch out for one another, and watch themselves. This night would be a time for courage, and the band of disciples would have to go into it girded in prayer, wide-eyed and abiding in their Lord. Yet for all of Christ’s clear words, they were overcome by the late hour and their big meal. For this, they felt the rebuke of their master who called them back to watchfulness. What can we take from all of this? Like the Disciples, we also live in interesting times. They were mere hours from seeing the Father’s redemptive plan for humanity unfold. They would hear Christ cry out “it is finished” as the offense of sin was paid and the Father’s righteous anger was quenched. Three days later, they would witness the resurrection of the one whose visage was marred beyond recognition. Forty days later Christ would return to his throne at the right hand of the father. We live on the eve of Christ’s return. We don’t day or hour, but we do know that it will come upon us suddenly. The events of that great and terrible day will be as transformative as Good Friday. In our day, we’re called to wait, watch and pray. One beauty of Lent is that it gives us focus and a time of self-examination. But how do we do these things, in a world that seem to be completely contrary to the Kingdom of Heaven? In the words of one contemporary pastor, we “pray, pray, pray, pray, pray”. As we ask, we will receive. As we seek, we will find. As we seek the Lord’s empowerment, we’ll grow in this. St. Paul encourages us in that in and through Christ, we can do all things. Tonight in this watch, I’d invite us all to a moment of self-evaluation and rededication to watching and waiting on our Lord.